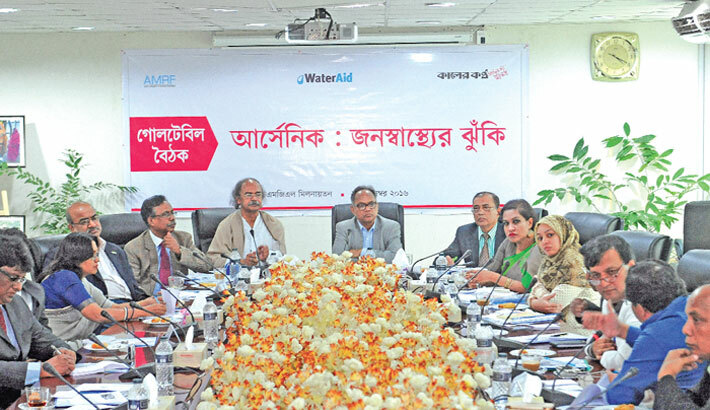 In december 2016, AMRF in collaboration with the Daily Kaler Kantho and WaterAid organised a roundtable on ‘Arsenic: Risk for Public Health’ in East West Media Group Limited, Dhaka, Bangladesh. 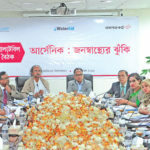 “Arsenic Mitigation and Research Foundation (AMRF) is working in Munshiganj to tackle arsenic problem. I have been involved in this project since its inception and I noticed that there are two types of people. One type of people lives in their ancestral lands, but a majority of them are away from their home. And then there are those who lost their homes to river erosion, and came here in search of job. While some of them are day labourers, some others are rickshaw-pullers. If we take the existence of this section of the people into account, we cannot claim that the whole Munshiganj is place of well-to-do people. Those who are well-off installed deep tube-wells at the premises of their homes and are out of the danger of arsenic. But what about those homeless people who are living in ghettos? I think they are vulnerable to arsenic contamination. We have been working for this section of people since long. We are creating awareness among them and arranging treatment facilities for them. “Arsenicosis is not a contagious or genetic disease. If more than 0.05 miligram arsenic is found in the water then it is considered harmful for the human health. Arsenic has been found in most of the areas of the country. People can be affected if they use the water where arsenic is prevalent. The study revealed that one person is affected per 1000 people. Country’s 63 percent women are affected by arsenicosis.